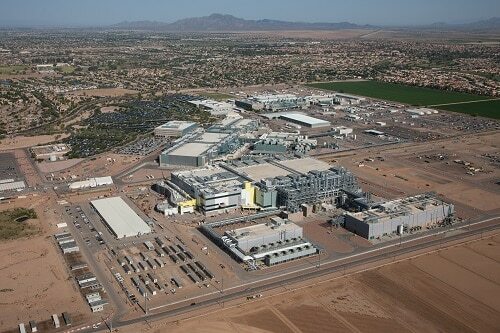 Intel’s Fab 42 in Chandler will create more than 10,000 jobs in Arizona. 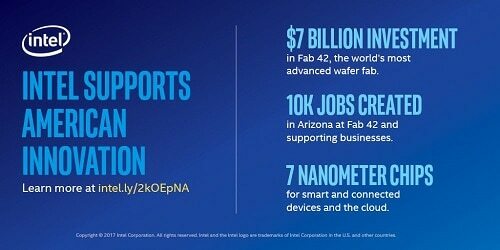 WASHINGTON, D.C., Feb. 8, 2017 – Intel Corporation today announced plans to invest more than $7 billion to complete Fab 42, which is expected to be the most advanced semiconductor factory in the world. The high-volume factory is in Chandler, Ariz., and is targeted to use the 7 nanometer (nm) manufacturing process. It will produce microprocessors to power data centers and hundreds of millions of smart and connected devices worldwide. The announcement was made by U.S. President Donald Trump and Intel CEO Brian Krzanich at the White House. The completion of Fab 42 in 3 to 4 years will directly create approximately 3,000 high-tech, high-wage Intel jobs for process engineers, equipment technicians, and facilities-support engineers and technicians who will work at the site. Combined with the indirect impact on businesses that will help support the factory’s operations, Fab 42 is expected to create more than 10,000 total long-term jobs in Arizona. Context for the investment was outlined in an e-mail from Intel’s CEO to employees. Intel is America’s largest high-technology capital expenditure investor ($5.1 billion in the U.S. 2015) and its third largest investor in global R&D ($12.1 billion in 20151). The majority of Intel’s manufacturing and R&D is in the United States. As a result, Intel employs more than 50,000 people in the United States, while directly supporting almost half a million other U.S. jobs across a range of industries, including semiconductor tooling, software, logistics, channels, OEMs and other manufacturers that incorporate our products into theirs. The 7 nm semiconductor manufacturing process targeted for Fab 42 will be the most advanced semiconductor process technology used in the world and represents the future of Moore’s Law. In 1968 Intel co-founder Gordon Moore predicted that computing power will become significantly more capable and yet cost less year after year. Making a leading-edge computer chip is the most complex manufacturing process in the world, engineering magic that turns sand into semiconductors, the foundation of the knowledge economy. The chips made on the 7 nm process will power the most sophisticated computers, data centers, sensors and other high-tech devices, and enable things like artificial intelligence, more advanced cars and transportation services, breakthroughs in medical research and treatment, and more. These are areas that depend upon having the highest amount of computing power, access to the fastest networks, the most data storage, the smallest chip sizes, and other benefits that come from advancing Moore’s Law.